This week's cool shows: BOA! OK, this is the short and sweet version since I've been called out of town on yet another family emergency. This week's big show is Birds of Avalon's CD-release show at Pour House on Saturday, plain and simple. Read my Five Questions interview with BOA's Dave Mueller on New Raleigh. Other cool shows this weekend include: Static Minds, Magic Babies and DJ Midnight Cowboy tonight at Tir na Nog; The T's with a Stones tribute band called Some Girls Friday at Slim's (have heard Some Girls is really good), and Unknown Hinson Saturday at the Berkeley. You can catch up on what happened through Triangle Music. I suspect Grayson and MyNC.com will be blogging later in the day. And two of my favorite from the Merge roster. Unless something is happening that I don't know about Breadwinner and Coral, two Richmond bands that grew out of Honor Role, are not playing this weekend's festival. But in honor of Merge's 20-year anniversary, and mainly because I love playing around with my new .mp3 turntable, here's a song from two 7-inch records that I've always loved, and pretty much defined the early 90s for me. 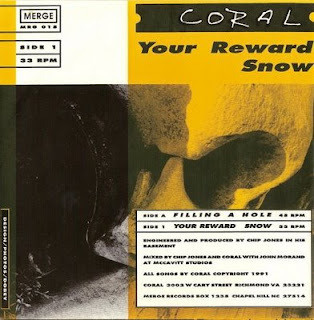 "Filling a Hole/Your Reward" by Coral came out in May of 1991 and literally blew me away. This runs a close second to Pure's "Ballard" as my favorite Merge release of all time. 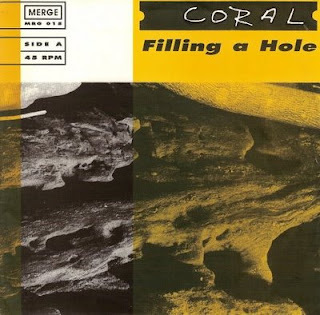 Coral on this release were Bob Schick (Honor Role), vocals; John Kovalcik, guitar; Steve Smith, bass; and Matt McGuigan, drums. Check out the liner notes that came with the Coral record. Mac talks about the upcoming Breadwinner release (below) and mentions "No Pocky For Kitty" coming out on Matador. 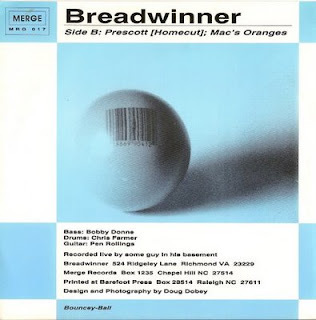 Breadwinner you probably remember as the band often credited with inventing Math Rock. That band included Pen Rollings from Honor Role on guitar, Bobby Donne on bass and Chris Farmer on drums. In this handwritten insert, Mac announces Pure has broken up and reveals that he likes the new Metallica record, which, I think, would have been the Black Album. 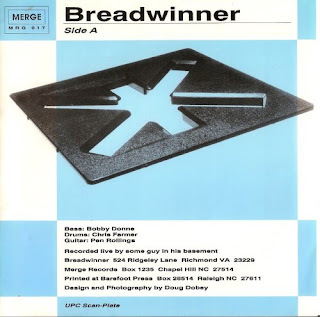 And, as an extra treat, here's a track from Breadwinner drummer Chris Farmer's high school band, Flat Stanley, who played in Greenville quite a bit when I was at ECU. This is from their 1987 album "Hot Cauliflower," most of which sounds a whole lot like The Connells (in fact, I'm pretty sure I saw them open for The Connells). This track, "Deciduous Forest," is instrumental, and though it's still pretty jangly, I think you can hear a little bit what Farmer eventually went on to do with Breadwinner. It shouldn't be any surprise that xxMerge, which begins tonight over in Chapel Hill, is this week's go-to event. Unfortunately, unless you already have tickets, you're not likely to actually go-to it, because it's sold out and (judging from a quick Craigslist perusal) there aren't many re-sale tickets out there. There will be a "limited number" of tickets available each night at the door, but I get the feeling that people will be lined up all day for each of these, so keep that in mind. There are a few free official and un-official xxMerge-related events out there, plus the big She & Him/American Music Club(duo)/Wye Oak show at Memorial Hall. More info including Merge-related films and films with scores by Merge artists, and a kickball game/BBQ here. Courtesy of Triangle Music. Check it out here. I've always wondered why they don't have more bands at the Jackpot. Not that they should turn into a full-scale rock club (I don't think people would want to give up the dance floor), but something like this once a month or so would be really cool. David Menconi has a nice article on Merge (whose 20th anniversary showcase is coming up this weekend) in the N&O. So, I finally got to see Righteous Fool, and they lived up to their rumored greatness. Dive Bar, however, is a pretty dark club to shoot video in, so enjoy this video for what it's worth. See more photos here. Thanks also to Dave from Away Team, who forwarded the video he shot of the band at The Pour House back in June. Just in case you haven't heard, Pipe's show at the Cave tonight has been canceled because Mike has Rocky Mountain Spotted Fever! Here's wishing to a speedy recovery so that they can play next week's xxMerge Fest. 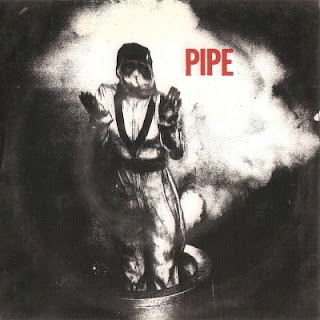 In the meantime, in honor of Pipe, and to kick off what I hope will be a weekly feature of an .mp3 of an old vinyl-only release, here's "Ashtray" from the band's 1993 single on Merge. This week's cool shows: Righteous Fool, Pipe and Hopeline Benefit! If you're in Raleigh tomorrow night, you have at least two great shows to choose from. First off is Righteous Fool with Black Skies at Dive Bar. Righteous Fool, you'll remember, is the new trio with former COC members Reed Mullin and Mike Dean. I had to miss them when they played The Pour House last month, and had to hear everyone who was there tell me what a great show I missed out on. Since I don't have to be up early Saturday morning, this is most likely where I'll be. Black Skies, of course, is always great. If your tastes run more toward pop-punk and indie-Americana, you really need to be at the Hopeline Benefit at Tir na Nog, which will feature Lonnie Walker, I Was Totally Destroying It, Hammer No More the Fingers and more. It's only $5, and it's for a very good cause. I'm actually going to try and make this show too. Not sure how that's going to happen, but I'm going to try. If you are in Chapel Hill, or remember the Chapel Hill scene of the 1990s, you absolutely MUST be at The Cave, for the reunion of Pipe. They're also playing next week at xxMerge. Normally I would be at this show, but it doesn't look like it's going to happen, so I'm hoping that they will continue to play together. ... because it would have been shot from the above vantage point. Seriously, I was so far back in the crowd that I could barely even hear Joan Jett, much less see her. I've heard crowd estimates as high as 15,000, which is a LOT of people to crowd into Moore Square. I do know that not long after we entered the park they actually cut off attendance and prevented anyone else from coming in. Since this is probably the only Downtown Live show where I've seen the actual headliner, I have no idea if that's unusual. I will say that the crowd seemed to be well behaved -- even when a light rain started to thin everyone out -- which was a relief to me and, I'm sure, to the Raleigh PD too! Earlier in the day I did get to see The T's, who were just as nervous as they could be, but still put on one of the best shows of their career. Their set was heavy on new stuff, which I was glad to hear. The first video, below, is "How It's Done," from their CD, but the second one is a new one called "Shine On." 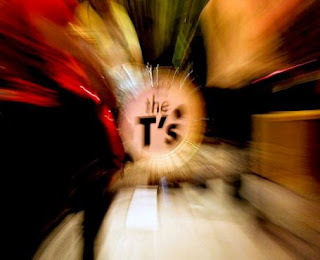 The T's - "How It's Done" from Mann's World on Vimeo. 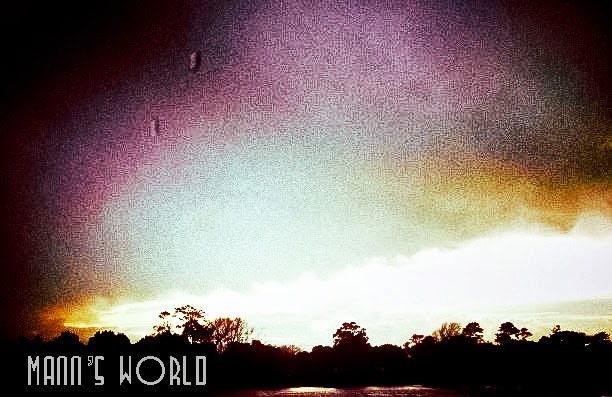 The T's - "Shine On" from Mann's World on Vimeo. I should note that after the show the band was apparently offered a spot playing at Tir na Nog that night, and yours truly tweeted that news, but for whatever reason they were told later that they were NOT playing. I still don't know the whole story on that one. Pure to play first show in 18 years! The very first show in 18 years will be in Asheville at The Grey Eagle on July 19 and then we're also playing in Knoxville, TN at The Pilot Light on July 21. They'll also be at XXMerge the following weekend, but unless you already have tickets, you're out of luck on that one. Let's hope the reunion is a permanent one! Rick Cornell reports in this week's Indy that Bombadil, having just released a stellar new album (also reviewed in this week's issue) is having to put off touring due to an as-yet-undiagnosed ailment with Daniel Michalak's hands. This week's cool shows: Joan Jett and The Club is Open! I admit, I have had some unkind things to say about the Downtown Live music series, but I have to applaud Deep South for getting one of the true legends of rock to play outdoors for free this Saturday at Moore Square. And I have to applaud them for getting a slew of fine local bands to support her. 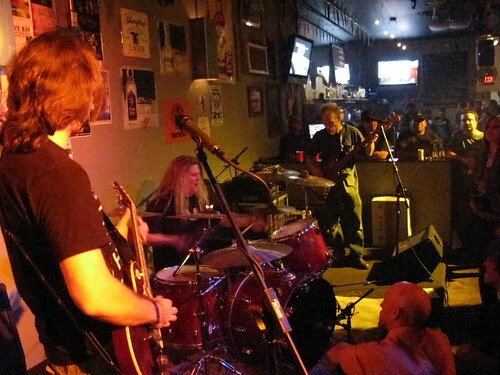 T's drummer Gary Poole, whose band is among those slated to play Saturday, was kind enough to answer Five Questions for me on New Raleigh, so check that out too. Here's the line-up for the evening. Panyelo, by the way, is a steel-band from Morehead City, which includes Bob Marley and Jimmy Buffett in its repertoire. I don't know how that's going to go over after the Bleeding Hearts. Over in Chapel Hill beginning TONIGHT is the multi-day, multi-venue The Club is Open Festival, with an all-local line-up including, among others, Pink Flag, Red Collar, Pinche Gringo and Future Kings of Nowhere. I can't say which night is best, because they all have great line-ups, but if I go, I am most likely to be at the Red Collar show at Local 506 on Friday. Folks, I had grand plans for hitting up Weese Fest, Let Feedback Ring and Red Collar and getting videos of bands I hadn't recorded before. As it turns out, a family emergency has taken up the last two days. If you were at any of those events and shot video or still photos, send me the link and I will feature them. I originally started this blog post by damning both youtube and Bryan Adams to Hell for all making me have to re-upload and re-link all my old videos, but then I decided to try and look on the bright side of things. Namely, I had a lot of old videos I'd totally forgotten that were stored on a long-dead server. Since I had the originals, I was able to upload them to Vimeo (which totally rocks), and now they're viewable again. I decided to play it save and not upload anything from well-known bands, or most of the old Cover-up footage. Where I've deleted photos, I've made note of it. I also was unable to find several videos I know I have, and made notes there too. Eventually I'm going to go back and search for anything local that's missing. In the meantime, if you want to see all my videos in one place, take a look here. This week's cool shows: Weese Fest and more! Folks, I'm doing something different with the calendar now. Instead of putting a big long list of shows in a blog entry, I'm going to write a few words about the best show (s) of the week, then direct your attention to the handy Google calendar over in that left-hand rail. There you can click on a show to learn more about it, and even add it to your own Google calendar. I all about getting rid of stress in my life these days, and the calendar had become more stressful for me than it needed to be. This is a lot easier on me, and hopefully a lot easier on you. 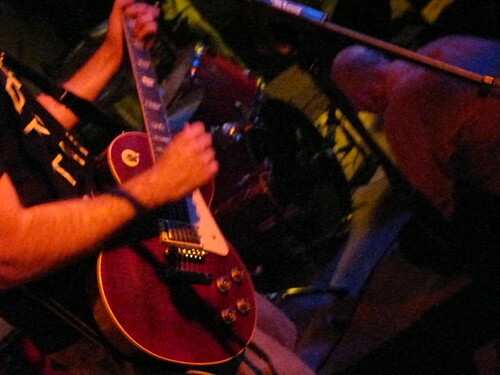 In the meantime I'd like to take the opportunity to plug Ross Grady's blog, Triangle Rock, which is a lot more in depth than mine, and also covers Chapel Hill and Durham more extensively than I do. Even though Mann's World is a Triangle-wide blog, it is Raleigh-centric. Ross is there to balance things out. Now, for the shows of the week! Since this is Fourth of July weekend, you have quite a bit to choose from. 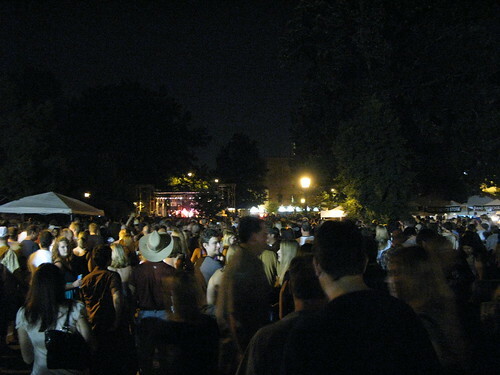 First off is the 30th Annual Festival for the Eno, which features a bevy of local bands in a family-friendly environment. If you're in Raleigh, you probably already have plans to go to Weese Fest, which is the annual birthday party for Pour House doorman Benton Weese. Birds of Avalon, the T's and Skullbuckle are on the bill, with headliners American Aquarium replacing Patty Hurst Shifter, who were originally on the bill. Make sure to get there early because there will be no advance ticket sales, and this one WILL sell out early. Apparently there's also food involved. Finally, on the Fourth itself, hit up the Let Feedback Ring Fest at Sadlacks, starting at 1 p.m. and featuring The Virgo Nine, Free Electric State and more. This show ends at 9 so everyone can head downtown for Red Collar at Tir na Nog.